Wow, these look fantastic. I think I may have to give sweet potato flour a try. And personally–selfishly ;)–I love that you’re moving in a gluten-free direction. With your creativity, I’m sure you’re enjoying the opportunity for experimentation that the vast array of GF flours provides. Looking forward to more recipes and hope your daughter is feeling better gluten-free! wow – these might get me over my fear of bourbon! (teenage memories *shudder*) Im sure you have posted these before but where do you source those lovely paper holders from? I never knew there was such a thing as sweet potato flour, but of course there is so much to know and not yet know about in the food world! I’ll have to keep my eye out for it because these cupcakes sound awesome… and baking with bourbon is a deal-maker in my opinion! These sound great. Where do you get sweet potato flour? Oh mama..these look great! I love sweet potatoe pie so I know thses cupcakes have to be very good!! They look excellent!!! These sound sublime… I love when accidents like these happen in the kitchen! These look and sound delicious. We’ve just discovered that our son has celiac disease, so these would be great. I do have another son, however, who has a nut allergy. Do you have a suggestion for replacing the almond meal? I’ve got a bag of sweetpotato flour in the cupboard I haven’t gotten around to using yet, I think these are the perfect excuse to break it out! I hope you have an easy transistion to gluten free, it just takes a bit of getting your head around. I’m gluten and lactose intolerant, but still manage to be a professional chef, and enjoy most yummy things. I wish you well and good luck. These look awesome! If you’re looking for a great gluten free cake flour, I stumbled on http://www.betterbatter.org, and their GF flour is AWESOME for cakes. We use it cup for cup(well, ounce for ounce, because we weigh) in our recipes. It’s an AWESOME alternative. I really can’t stress how well stuff turns out – we’ve had several compliments since we switched – and sometimes can’t even tell the difference!! I love the sweet potato. Maybe beside sweet potato flour, I can just use a potato cut. Awesome! I will have to try this one for certain. 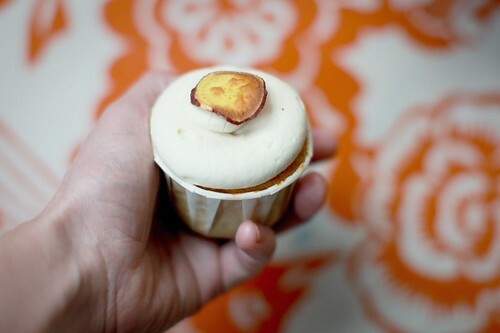 Oh my,I love sweet potatoes and this cupcake looks magical! My taste buds recently met a sweet potato that wasn’t served next to a turkey, smothered with marshmallows- and it was delicious! I’ve been on the hunt for more recipes involving sweet potato and this one is just what I was looking for! The sweet potato flour sounds new to us! We must try these cupcakes, they must be excellent! These look amazing- what tips do you have for getting your cupcakes so professional looking? I recently tried a recipe from ‘What’s New Cupcake?’ (admittedly a rather tricky duck cupcake) and the results were rather comical. I’m adding this to my Holiday Folder right now! Hi!! I’m Paula, I’m from Argentina! I Love your blog,I Like to try with diferent flavors too, unfortunately in my country doesn’t exist some of the products that you use in your recipes. I hope you will be back soon to share more cupcakes recipes! Brilliant. 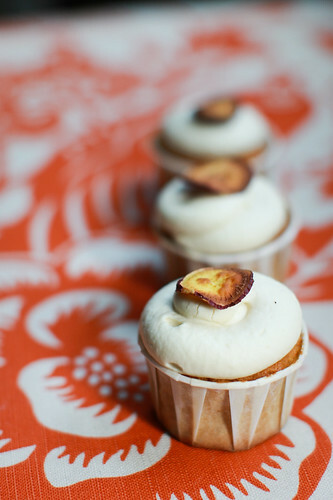 I never would have thought of sweet potato cupcakes. I have just found your website and am in love with it – you have the most AMAZING recipes and I will be trying them out soon! This recipe calls for almond meal, but I am wondering if I can substitute something else instead because of nut allergies. Any thoughts? I <3 your website/ blog!!! I love all the different flavors you try. Last night I attempted the strawberry ganache filled cupcake with ganache and buttercream icing… about 60% FAIL! Buttercream hates me… in any event, I cannot find a decent piping bag and was wondering what do you use? I recently bought one in IKEA (i know!) it was good, but, it was a thin fabric and my hands were so OILY!!! It was far superior to the plastic. Yours looks like a canvas like material.. can you recommend? wow this cupcakes look so so good. Finally. Somewhat healthy, gluten free goodness. Thank you for your work!!!! Ahh.. these look so good. I’ll have to try them soon. What a great idea! Interesting to see this recipe using sweet potato flour. I’m going to try out a recipe that uses sweet potato puree soon. not sure how different it would be. Might have to do a trial run some time.